Ongoing development of a historical site located at Newstead (Brisbane), sees it transforming in stages to a new mixed use precinct. The name derives from the sites original use – the gasworks, and part of the project is to protect the heritage listed gasometer located prominently amid the gasworks buildings. Originally built in 1863, the gasometer once stored gas in a large bladder contained within its frame work. The Gasometer has been fully restored ensuring the ornate pinnacles and lace work beams stand as equal alongside its newly constructed neighbours. It creates a unique contrast set amidst the strong lines and bold shapes of the modern architectural features of the Gasworks building development. Designed by the same team that worked on the adjacent Energex building – Architect Cox Rayner and builders FKP, the buildings in this phase of construction comprise of Building A on Skyring Terrace (five storeys) and Building E on Longland St (three storeys). The profile of the lace work makes a delightful silhouette. G.James Glass and Aluminium supplied and installed glazing facades, doors, windows and some extruded sun hoods. Building A has a proposed 5 star green star rating – so energy efficiency, acoustics and air infiltration were important design factors. As such, products with proven test results were selected for use. Building A comprises ground floor shop front retail with four upper levels of offices. The offices utilise the flush glazed 651 series glazed with IGUs made up of green glass with a low E coating for energy efficiency, a 12mm air space, and 6mm clear glass internally. This also assisted in achieving a better acoustic rating. Spandrel panels were made with a green ceramic painted surface – a premium spandrel glass option that maintains the look set by the vision area. Well lit clouds light up the façade at sunset. Building E was a combination of two levels of residential apartments along Longland Street, two levels of office space along the breeze way between the buildings, and a retail shop front precinct on the ground level. The offices in building E utilize the 650 series, also flush glazed, but to accommodate 11.52mm laminated glass. The glass has a low E coating and the same colour, but didn’t require the same level of acoustic rating or energy efficiency. The office glazing also incorporated architectural features such as glass fins for extra strength and sun hoods for protection. The residential apartments use a range of glazing styles. Fixed framing used the 650 series system with 265 series awning windows spaced across the facade. Balconies feature four side supported 550 series balustrades with access through 445 series sliding doors. Building E is on Longland St.
Balustrades, awnings, fixed windows and sliding doors are scattered along this frontage. The retail areas required a centrally glazed pocket, but the opening size and wind loads exceeded the constraints of the current system. As many architects are looking for options to make windows larger, the decision was made to replace the current aluminium vertical members, the mullions, with a stiffer option. The new design also incorporated the ability to strengthen it further. This new addition to the G.James range is used extensively throughout the Gasworks project. The strip of retail walk way along Skyring Terrace. Practical completion was achieved on the 3rd August, 2013, however there are still minor works, interior fit outs and landscape work under way. Building E has been designed so a residential tower can be constructed above it in the future. The Gasworks project is an aesthetic feast, and well worth a look if you are in the area. Please consult the interactive map project to get the location and a summary of the project information. The twists in the sun shade and streaks across the glass façade make for a distinctive frontage. The west elevation takes advantage of the views towards the river. East view looks back towards the city, and over the gasometer. The location of the gasometer is directly to building A’s right on Skyring Terrace. Brisbane, being the location of our Head Office, sees many fine examples of G.James workmanship. Here, we outline some of the biggest and best projects undertaken to showcase our capabilities in recent times. The interactive map is designed so you can take a tour of some of our most recent and notable works. Either at your desk looking out a CBD window, taking a stroll around town, and driving past a building or through an area you have always wanted to know more about. the towering Aurora and Riparian plaza. 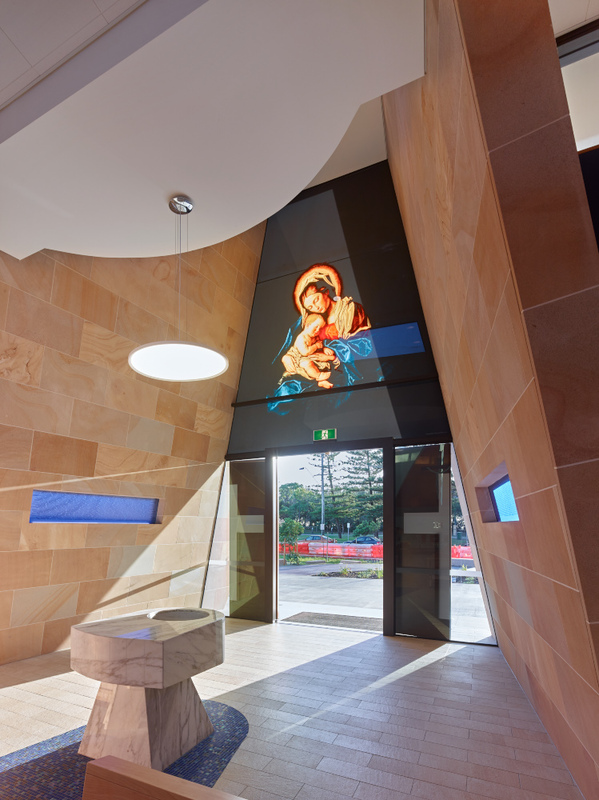 There are many buildings that have achieved the coveted green star energy efficient design, some interesting artwork on glass designed by local artists – its worth a visit to the Anthropology Museum at UQ to see the ceramic printed window alone. 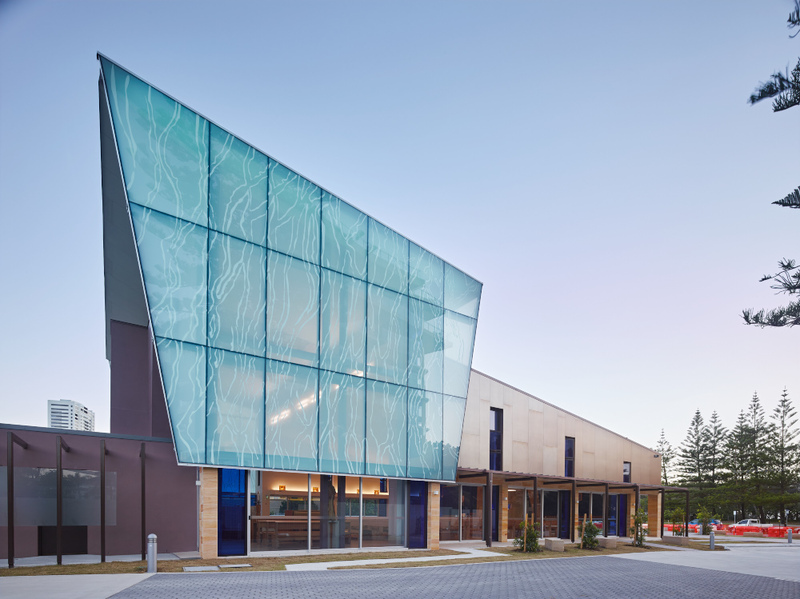 Some of the buildings have specialised glass systems to suit the works being done, like the Translational Research Institute and the ABC headquarters. There are projects that have altered the face of a tired old façade, so if you look at an old image of QIMR, you won’t recognize it. And then theres the Suncorp Stadium which gives you a glimpse inside a place where state pride and competition is on the line. You can have a look at the map and plan out a scenic drive, or target specific jobs, or just get an idea of what we have produced, in your area. As you can imagine, there are too many jobs to make this an all-inclusive list, but we aimed to include a range of jobs reflecting different styles and features. A brief dossier on the project is included – a photo of what to look for, basic job data and links to further information on the project. G.James can help you with any further information required for the jobs represented. Until then, enjoy this insight into the River City. A green star accredited office block constructed in one of Brisbane’s growing commercial areas, 51 Alfred St comprises of a ground floor retail space with 8 levels of office space above. 51 Alfred St, Fortitude valley was constructed by Blackwatch Projects, to the design of Willis Greenhalgh Architects. The sustainable design intended to minimise its carbon footprint was a urban friendly solution to council and the community. It includes a smart foyer, featuring floor to ceiling full height glazing on two street frontages, and superb views to the city above level 2. Development of the project went from initial “design in principle” early drawings to installation of the finalised glazing products. The project had a short time frame, and lead times for manufacture and installation had to be carefully managed. Known for its location, the street number is prominently positioned. The south western face has vertical sunshades, composite cladding and a two tone spandrel area. The building incorporates shopfront glazing from ground floor to level 1 that used the 850-500 and 650-500 series framing systems. Hinged doors are 475 or 476 series, with 445 series sliding doors (as on some upper levels, also). G.James picked up the cladding package for the ground floor columns, which was made and fitted by the G.James Joinery department. QuickAlly, G.James scaffolding division assisted with providing access to entry the shop front entry glazing. Upper levels utilizes the 651-500 curtain wall suite. The design had to allow for the addition of randomly placed aluminium horizontal and vertical fins that use different shapes in keeping with the difference in direction. There are also composite cladding positioned irregularly across the southern face, and frames the edge of the eastern face. All of the differences in cladding and sun shading incorporated into the curtain wall, made for a wide variety of specialist panels. This required coordinating the transportation and installation of the panels to be highly organised. Careful design, preparation and on site works were given particular attention at the corner feature to achieve the seamless angled cladding and glazed finish that spans the full height of the buildings office area. The north face has horizontal sun shade louvres. The reflection gives you an idea of the view from the building. IGU’s were used in the vision areas of the tower to combat city noise and provide sufficient thermal and solar efficiency to achieve the green star accreditation. 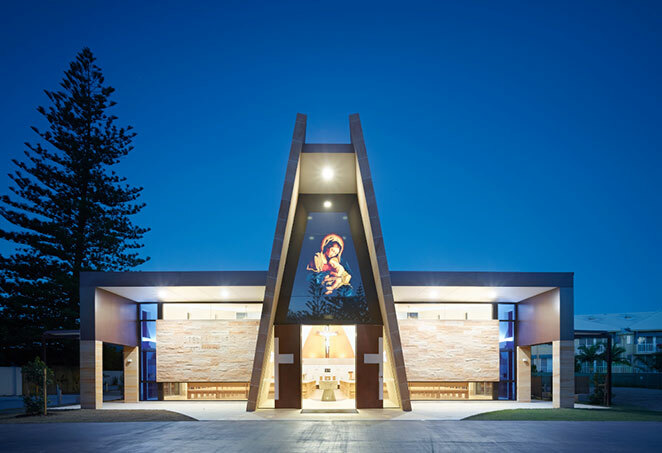 The spandrel area uses a colourlite backing on clear glass to achieve the opaque finish. Charcoal and White were used to keep in theme with the buildings monochromatic scheme that highlights the slash of copper that makes the corner feature stand out. There was no tower crane available for this job, so all of the framing hoisted into the floors from a crane on the street below. Including the “Spider Hulk”, the name of the lifting crane that positions the panels into place. “Spider Hulk” is the name of the machine that lifts the panels into position on the building. Early design intended the framing to be fixed into cast ins – a quick and minimal fixing method that utilizes the concrete structure to enclose and support the framing. Later changes, however, meant that the frame fixings were redesigned and engineered to be fitted with bolts into the concrete. The ground floor was site glazed as the size of the glazing was so large. There was also a curtain wall panel that needed to be site glazed. This requires extra safety measures and some specialised techniques to carry out. Blackwatch had a tight program which was run like clockwork. It enabled overall job satisfaction with the resulting installation of the work performed by G.James, and we look forward to working on further projects together. Access to the lobby and coffee shop. The curtain wall framing is nearly installed. You can see the glazing wrapping around concrete features. The angle formed by the junction of the cladding and the glazing continues all the way up the office block. Horizontal sun shades and composite cladding features. Column cladding design looks sleek. Nissan’s brand new Inifiniti Showroom at 5 James St, Fortitude Valley, Brisbane, offers a new option of luxury car, provided at the level of traditional European car manufacturers BMW and Mercedes-Benz. The concept is to mimick the service offered to this level of customer but aiming at a new audience. The striated pattern is reminiscent of a sheer curtain. To accomplish this, Infiniti’s IREDI (Infiniti Retail Environment Design Initiative) developed a world class facility that will catch the eye of a newly emerging, discerning audience. Utilising Japanese notion of “Omotenashi”, or the heart of hospitality, a high level customer experience was developed from presentation to purchase. The Brisbane showroom is the largest in Australia to date – the 2000m² complex comprises of a lobby, a lounge and the showroom, framed stylishly in printed glass showroom window. The printed glass frames the main entrance and showroom. 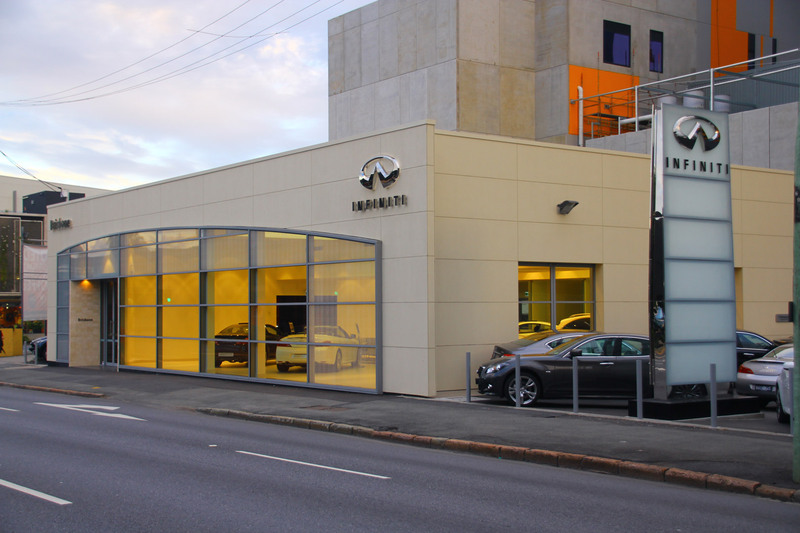 Designed by the architectural firm, Brisbane based McKerral Architects , the curtain pattern was supplied as part of the global Infiniti corporate image. The original pattern needed to be refined and approved internationally prior to manufacture. G.James worked in conjunction with the design team to finalise the artwork. The printed glass produces a privacy shadow screen by day, but at night with lights behind it, the printing disappears. The print work and positioning lend itself to the overall highly polished finish presented to prospective clients. The Infiniti brand displayed prominently on the facade. The printed glass produces a shadow line by day, but at night with lights behind it, the printing disappears. Our Bundaberg office has been transformed with the use of our latest colour printing on glass technology. Over the last few months we have covered the topic of digital ceramic glass printing several times on this website. Our Bundaberg office located at 49/51 Enterprise Street, Bundaberg was due for a refurbishment, so G.James decided to put our printing capabilities to use creating a vibrant new façade for the building. 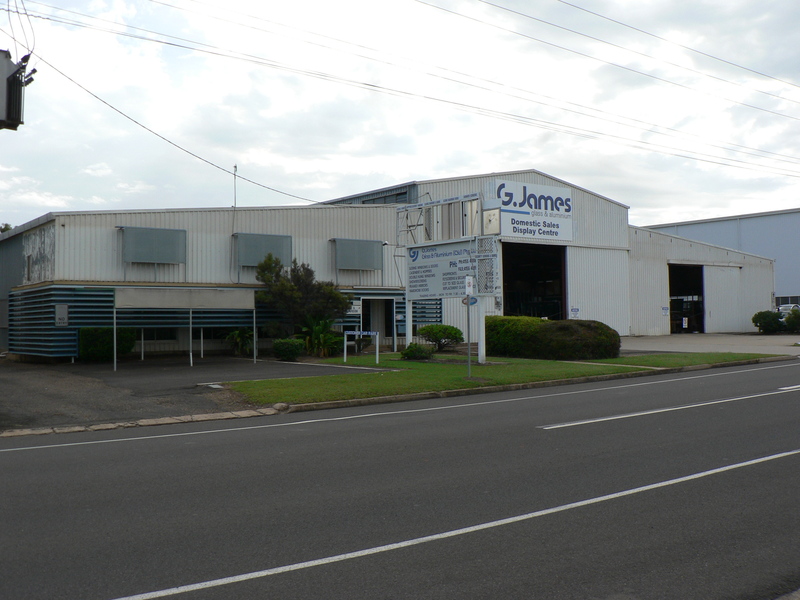 The Bundaberg Branch was established in 1972 and is where former branch manager Geoff Thorne started his career with G.James. When Geoff retired in August 2012 he reflected on his time at G.James saying “When I started at G.James, this building was the best looking building in the street. Now that I am retiring, the building is again the best looking in the street”. The Branch is now managed by Robert Astill and continues to service Bundaberg, Wide Bay & southern sector of central QLD. The old office building was in need of refurbishment after many years of use. The new sales office and showroom features a fully glazed façade with glass spandrels ceramic printed with a full colour representation of the lush sugar cane that is common in the Bundaberg region. The façade fits with the character of the area, and puts a striking face on our sales office. Sunshades were also installed above the vision glass around the building, to help keep the north facing building cool. The first step was to find a suitable image for the building. The Bundaberg staff were involved in selecting an image they would be happy to have on their office building. It was important to include the staff in the decision to make sure we created a building they were happy to tell friends and family about, as well as work in. We selected the sugar cane image below, to be placed on a blue background. The next step was to modify the image to maximise the printed effect over multiple floors. We created a concept render to ensure the image wouldn’t appear too busy or overbearing. After the concept was complete, the G.James team scaled the image file to suit the CAD drawing of the Façade. This resulted in a very large image file requiring a couple of powerful PCs to do the processing work. Image and CAD drawing combined. Each panel that required printing was then identified. 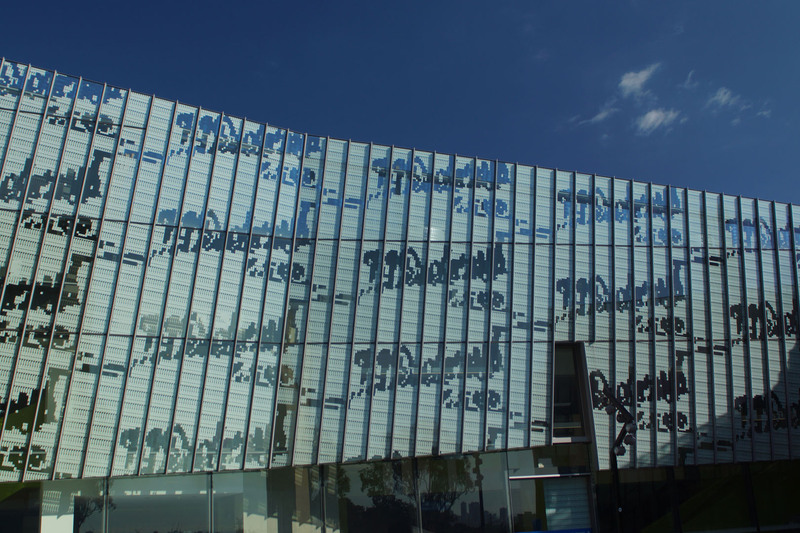 The vision glass panels were excluded and we printed on a total of 47 spandrel glass panels. The façade has already attracted significant attention from those passing by, and has transformed our sales office into an exciting and unique advertisement for our business. Keep your eyes peeled for another exciting transformation in the new year – G.James Cairns. To find out more, please visit our glass printing gallery, or contact G.James Glass Sales on (07) 3877 2866. Our Bundaberg office can be reached on (07) 4155 4888. This month’s guest post is by Bernd Hoffmann of Hoffmann GTD Glas-Technik-Design, and discusses in-depth the process and intricacies of ceramic, digital glassjet printing. If you haven’t already, you can also read last month’s introduction to digital printing on glass. Modern digital printing technologies using ceramic inks are providing new interesting opportunities for long-lasting decorations and optical effects on glass. 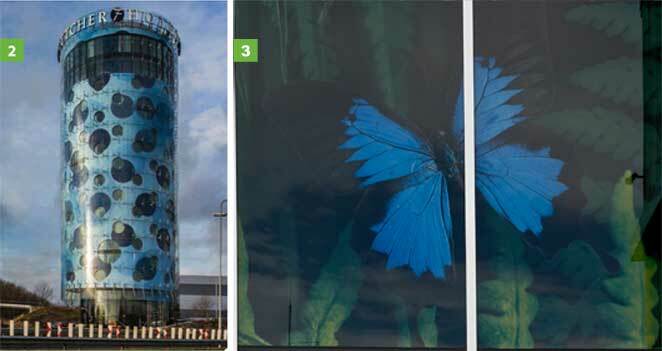 This way even multicoloured very large format images and decors can be printed and fired on glass providing reflective high-resolution prints, turning the functional glass skin of a building into a more or less translucent artistic screen. After a short introduction into the basic principles of the Ceramic Digital Printing technology and the world of Glass Façade Design the presentation will give an overview about the advantages and limitations of the Ceramic Digital Printing for architectural applications. Different design intentions, challenges and achievements will be presented and discussed. TOPAZ – a helpful concept of preceding considerations for the design process of glass facades will be introduced.